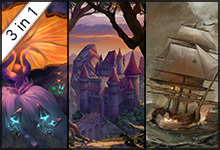 We’re pleased to announce Steam launch of Arizona Rose and the Pirates’ Riddles. The game is launched if 20% discount until Oct 26th. We submitted our third game to Steam Greenlight – Seven Seas Solitaire. If you’d like to see the game available on Steam please vote YES. 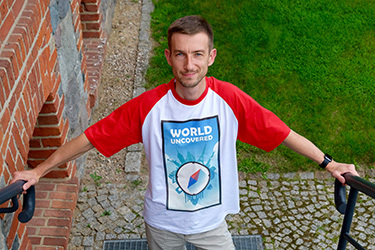 World Uncovered and marathon run! Sometimes you travel, sometimes you run… And sometimes you travel to run Last week me and my friend Eliza traveled to Mierzecin. I traveled to root for her, she traveled to run in marathon. We both wore World Uncovered themed t-shirts. The event was hosted in spectacular woods, which happened to be a joy and trouble for runners. They simply got lost during the run and almost no-one finished the run. But still, it was lovely being there. What is World Uncovered? World Uncovered tracks your travels for you and maps them in vivid detail. It will show you where you’ve been, how fast and how high you were going, and how often you’ve returned to your favorite places. Can you walk every block in your city? Climb all the mountains in your area? How many countries have you visited? What landmarks have you seen? Find out, with World Uncovered. It’s also the best alternative to Fog of World! Download World Uncovered for iPhone from the App Store. World Uncovered released! Yours best lifetime travel tracker. 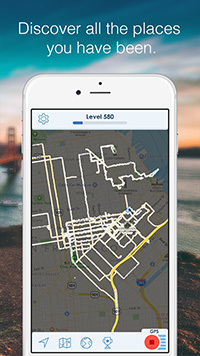 World Uncovered tracks your travels for you and maps them in vivid detail. It will show you where you?ve been, how fast and how high you were going, and how often you?ve returned to your favorite places. Can you walk every block in your city? Climb all the mountains in your area? How many countries have you visited? What landmarks have you seen? Find out, with World Uncovered. We believe World Uncovered is the best Fog of World alternative available. Read about all the great features of World Uncovered on website dedicated to our app – http://www.worlduncovered.com. OK. We’ve been quiet for quite some time. Even too quiet. Finally, I can announce what we’ve been working on for all those months. Please welcome World Uncovered. Your feedback is regarding website design appreciated. The app is not ready for download yet, but we hope to have it launched in July 2016. We’re trying to bring one of our most successful games, Arizona Rose and the Pirates’ Riddles, to a larger audience. Steam is a digital game distribution platform, providing convenient access to games to millions of users, and Greenlight is a way for game fans to decide which games get onto Steam. We need your help to make that happen, so if you’re a fan of our games and would like to see Arizona brought to a larger audience, your vote would be greatly appreciated. Arizona Rose: humble antique collector, or treasure-hunter extraordinaire? While shopping for exotic antiques, Arizona stumbles across some old maps, which turn out to hold the key to Blackbeard’s lost treasures! But the treasures’ locations are concealed by a clever code, and Arizona needs your help to crack it. The Best Solitaire games in one bundle – Save Up To 40% on Avalon Legends Solitaire 1 & 2 and Seven Seas Solitaire. Save Avalon as druid Mallard and rescue your beloved Elaine as the captain of the Falcon. 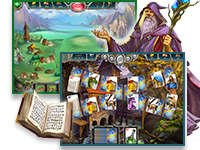 Read more about Avalon Legends Solitaire 1, Avalon Legends Solitaire 2 or Seven Seas Solitaire on our website (demo version available). The bundle is available for Windows and OS X. It’s only $17.95 instead of $29.91. Buy Solitaire Legends Bundle for Windows for $29.91 $17.95. Buy Solitaire Legends Bundle for OS X for $29.91 $17.95. Avalon Legends Solitaire 2 for Android released on Google Play! I am pleased to announce that our most magical solitaire game is available for Android phones and tablets on Google Play. Avalon Legends Solitaire 2 can be downloaded for free (try before you buy) and the full story can be unlocked for one time fee. The fate of Camelot is in your hands! The Druids of Avalon channel the forces of nature through their magic cards, using them to weave powerful spells of growth and healing. There are rules to their magic, however, and the cards must be placed in the correct order by a careful hand in order to function. Harness the power of the cards as you travel across Avalon through 300 meticulously crafted levels of engaging solitaire to collect the resources you need to restore the kingdom to glory. Simultaneously relaxing and challenging, Avalon Solitaire 2 features 24 power-ups, over 30 buildings to rebuild and reap benefits from, plus wild cards, jokers, hazards and more, making it a must-play for solitaire fans! The game is also available on Windows, Mac OS X and iOS. Download Avalon Legends Solitaire 2 from Google Play. Download Avalon Legends Solitaire 2 for Windows. Download Avalon Legends Solitaire 2 for OS X.
Download Avalon Legends Solitaire 2 for iOS. 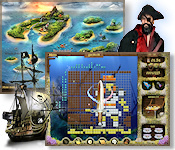 Seven Seas Solitaire available for Android on Google Play! I’m pleased to announce that one of our greatest solitaires is now available for Android devices. Please give Seven Seas Solitaire on Google Play a warm welcome. The high seas are rife with the makings of legends: pirates, storms, lost treasure and terrifying monsters abound. After a glorious career in the King’s navy, you were looking forward to a relaxing retirement, and marriage to the beautiful Elaine… until she went missing, and you were blamed. Now, your only hope to reclaim this happy life is to return to the sea once more, to find Elaine and bring her home. 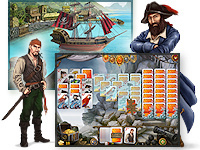 Download free trial of Seven Seas Solitaire from Google Play now! Mystery Riddles for Android released! Good news for Android fans. 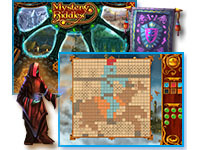 We just released Mystery Riddles for your devices. The most powerful magicians in the kingdom of Mysteria were once the Pictomancers, who had the power to imbue painted or woven images with arcane energy. They have all but disappeared from the land, taking their secrets with them, but the Great Tapestries they created in their heyday have kept Mysteria from harm… until now. With the Great Tapestries fraying and darkness returning to threaten Mysteria it’s up to you, the last Pictomancer, to quest throughout the kingdom and restore these powerful images and save the kingdom. Take on the journey in one of two modes, tackling either the always-popular Pic-A-Pix puzzles or the brand new Fill-A-Pix! You can download Mystery Riddles from Google Play for free. Sneak peak – Avalon Legends Solitaire 3! Animal Drop Safari launches on iOS. Get your iPhones and iPads ready!